Yesterday, Israel killed at least 55 Palestinians as they attempted to cross from Gaza into Israel in defiance of Israel’s economic blockade of Gaza and the opening of the US embassy in Jerusalem. More than 2400 were wounded. Today Palestinians everywhere commemorate the 70th anniversary of the Nakba – the “catastrophe” of the expulsion of the majority of Palestinians from their homes in order to create the state of Israel. The Nakba is not only a moment in time, but an ongoing uprooting that attempts to erase the very existence of Palestinians who have lived under continuous occupation for more than two generations. –Yosef Weitz, director of the Jewish National Fund’s land department and founder of the Transfer Committee, 1944. But the young have never forgotten. 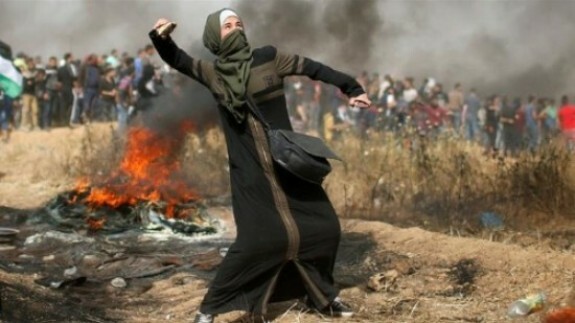 In spite of a suffocating siege – checkpoints, expanding settlements, unlivable conditions, massive imprisonment, and almost daily killings, Palestinians have never stopped resisting. Close to 100 have died since the beginning of The Great Return March, yet thousands continue to defy live fire to demand the right to return. The occupation would not last a day without US military and political support of Israel, and those of us who are committed to building a world without racism and war need to challenge U.S. complicity and stand in solidarity with the Palestinian struggle. Wednesday, May 16th: Protest Ehud Barak! War Criminals Not Welcome in the Bay Area!